It's no secret that I've been struggling with acne for some time now, and boy is it frustrating. I have sensitive, combination skin -- 9 on the dryness scale, 6 on the oily scale (out of 10). So, finding products that can keep my skin moisturized and don't break me out is seriously tough. Finally, after trying many different products that never led to any improvement, I decided to just go back to the basics -- and it worked! My skin has been doing much better recently, and I can see my acne starting to fade. 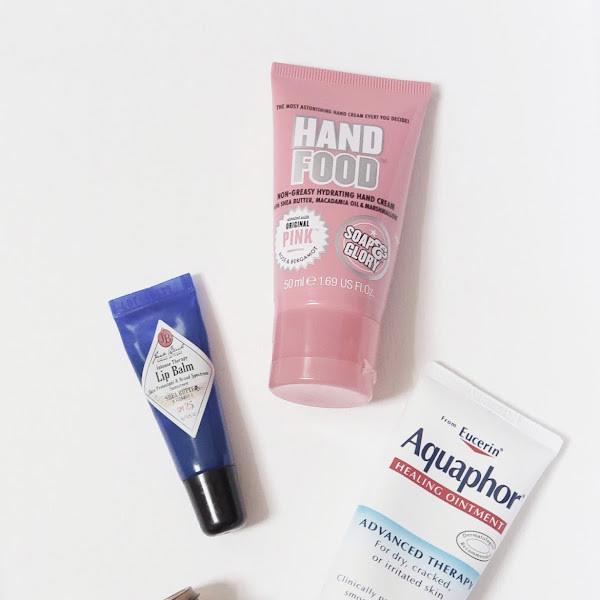 In the midst of the expensive skincare craze currently taking over the blogging world, I thought I'd show you that you don't need to break the bank to clear your skin, if acne if something that you're battling as well. And cutting back your skincare regimen to a few simple and gentle products might just do the trick! 002. Pre-Cleanse Hydration "Mask" The only way I have found to actually lock some moisture into my face is to smear a thick layer of Aquaphor (review) all over and leave it on for about half an hour. This doesn't break out my skin, and when I go to apply makeup the next day, I feel a little bit less like I have reptile skin. I'm a super-fan of this product, and I love how glowy and hydrated it makes my face. 003. 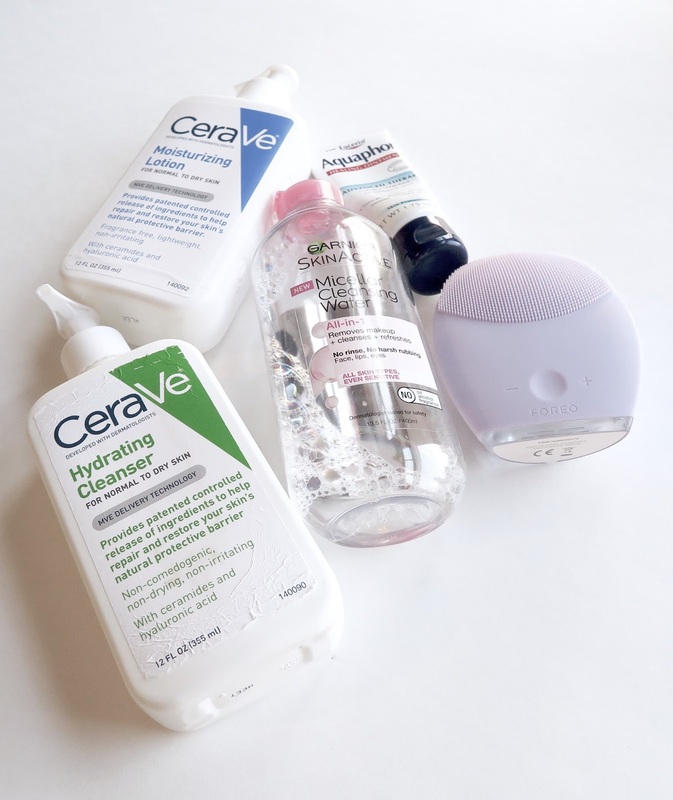 Cleanse To clean my skin, I've been using the CeraVe Hydrating Cleanser. This 12 oz bottle lasts forever (which is why the bottle looks a little icky -- it's spent some time in my shower) and does a great job of gently cleansing without stripping moisture. I use this with my Foreo Luna 2 (review), which has literally been a god-send (and really isn't that inexpensive at all but shhhhh I had to mention it). I attribute much of my improved complexion to this gadget; it really does a wonderful job at deep cleaning. 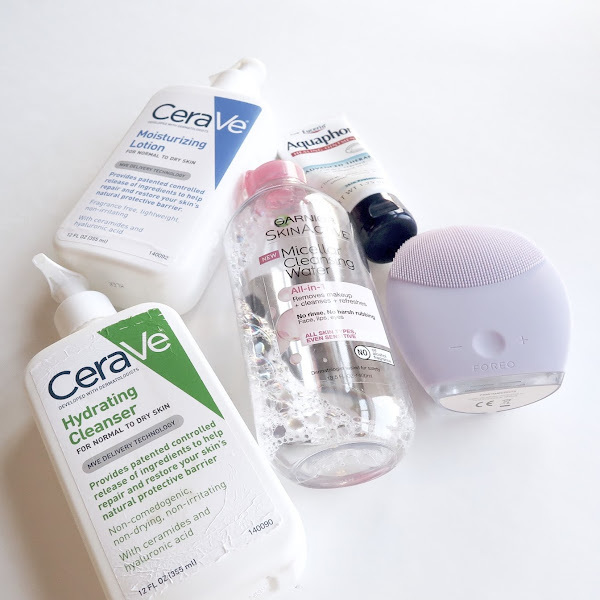 My face has been so much smoother and clearer since I began using this device + cleanser combo. I'm so pleased that my skin is finally reaching a better place, and I'm looking forward to exploring a bit more with skincare now that I think my face can handle it. 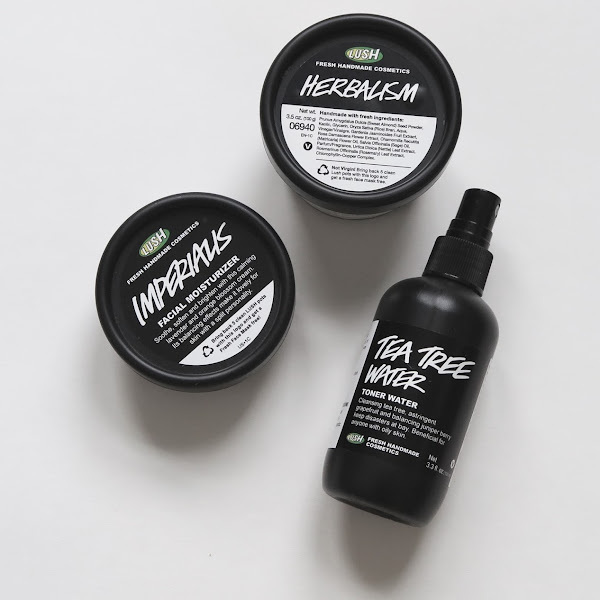 I actually just placed a skincare order on Lush, so look out for some posts on that! If you're having problematic skin, I encourage you to try just the basics for awhile. Using a lot of different products on your skin constantly can cause more harm than good for some of us folks with sensitive skin. Hope you are all having a fantastic January so far! I'm glad to hear it's been working! And thanks for your thoughts -- as I said, tricky to find products that moisturize w/o overdoing it and causing acne! 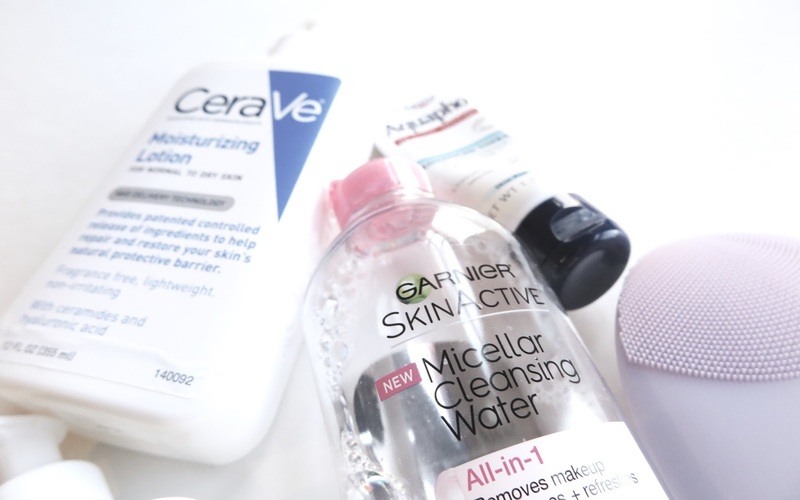 I tried the Garnier micellar water, but I'm not such a fan of it. I love the one from Bioderma!